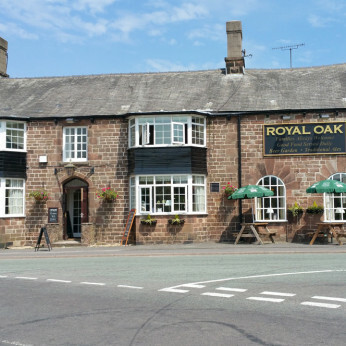 The Royal Oak Is A Traditional Country Pub. A Free House Located In The Glorious North Staffordshire Countryside We Offer A Warm Welcome, Real Cask Marque Ale, Fine Wines And Quality Locally Sourced Food. Whether you are popping in for full meal, a quick bite or simply a drink with friends, our friendly and experienced team are waiting to welcome you. The ‘Oak’ is a home from home, hosted by landlords Paul and Julie Richmond, with a relaxed and convivial atmosphere where the traditional country values of friendliness and hospitality abound. The ‘Oak’ is a perfect spot in the countryside to bring your family to relax and eat. Stop for refreshments and food if you are walking or cycling – muddy boots and cycle gear are welcome (secure cycle parking available) and the pub is dog friendly. The ‘Oak’ is rapidly becoming recognised in the area as a significant destination for food as well as being a great place to socialise. Come and sample our excellent menu, where everything is freshly cooked to order by our renowned local Chef.